My thanks to those of you who offered sympathy and encouragement after my recent lamentation about suffering yet another rejection, this one of a novel for which both my agent and I had high hopes. I've done a good bit of thinking over the past five days, trying to figure out if there's any reason for me to get back to writing. I mean, after all, why bother? The odds of having a novel accepted by a publisher are slim, the chances of it making it big are even slimmer. Chip MacGregor's blog recently indicated that, of the 250,000 books introduced into print last year, four sold a million copies, another fifteen sold half a million. That's less than 0.01% of the new books that were huge successes. And many editors will tell you privately that they are looking for authors whose fiction books will sell at least 50,000 copies. A daunting prospect, isn't it? So why should I get back to the computer and start writing again? As Anne Lamott points out in her wonderful book, Bird By Bird, writers write because it's just what we do. Of course, those of us who write Christian fiction or non-fiction do it because we feel a higher calling, essentially a ministry. But even without that, I believe that I would write. After five days of not opening my current work-in-progress I found myself wanting--no--needing to get back to it. I wanted to see what was going to happen to Dr. Anna McIntyre, who finds herself deep in difficulties that are not of her own making. So, I'm back. And I'm smiling. I realize that writers, like baseball managers, live constantly with the shadow of rejection hovering over them. Managers are hired to be fired, and writers write to be rejected. But sometimes you win the World Series. And sometimes you get the call, the email, the letter that tells you someone likes your work and wants to see it in print. That has happened to me once--with the publication of my book, The Tender Scar: Life After The Death Of A Spouse. Oh, there have been articles accepted for publication, appearing in some pretty prestigious periodicals. But I'm still waiting for a publisher to read through one of the four novels I've completed and offer me what the Muppet Movie calls "the standard rich and famous contract." It hasn't happened yet, and it didn't happen yesterday when my agent called. My first novel was essentially written "to order," and the editor, after one revision, took it to the Pub Board, where it died an ignominious death. Then another editor at a different publishing house really liked my first and second novels. He had me work with an independent editor on both of them, offering assurances (to the book doctor, not to me) that a multi-book contract was on the horizon. Then came the polite and appropriately sympathetic email: just not quite good enough. Most recently, I wrote another "to order" novel in a different genre. My agent agreed that it was excellent work. She sent it to the publisher of the editor who'd requested it, where a different editor somehow got hold of it and passed on it. Bummer. If you want to be reminded that rejection goes with the territory, read a classic post by editor Nick Harrison at the Charis Connection. Nick shares his reaction to getting a work of his, one he thought was his best to date, rejected by a publisher who'd done two other books of his. That really struck a chord with me. Nick, you may have not only kept me from slashing my wrists, you probably are going to drive me back to the computer to keep writing. My wife works SuDoKu to keep her mind sharp. Maybe, in addition to being a response to the call I still feel, writing can help me keep my mind sharp. I'm going to take a few days off to think about it, but I suspect that I'll be back at the keyboard soon. Stay tuned for further details. Meanwhile, feel free to share your rejection stories in the comments section. * Open the book you are currently reading, or the one nearest your computer. * Turn to page 123 (so, obviously, the book has to have this many pages). * Count down to the fifth sentence. * Tag five more people. I'm currently working my way again through the works of Robert B. Parker, whose fiction I consider some of the most entertaining I've ever read. Dr. Parker, a former professor of English, writes some of the smoothest prose I've encountered. And I love the way he develops his characters. This one is his first novel, The Godwulf Manuscript. "Get far enough away and it looks kind of pretty, don't it?" she said. "You only get order from a distance. Close up is always messy." Instead of tagging five other folks, I'm going to suggest that you, dear reader, do this on your own blog (or as a comment here if you wish). If you choose to bedevil some poor soul after that, be it on your head. Come back this weekend and we'll see if I'm ready to post my current rant (apologies to Rachelle Gardner, whom I think owns the term). 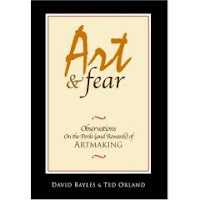 I've just finished reading a fascinating book: Art & Fear. I'm indebted to Brandilyn Collins for calling this book to my attention. On her blog a few weeks back, she featured a series of discussions drawn from the book. At first I was sort of put off by the title, but as the week went on and the posts continued to touch me, I ordered the book. Of course, as often happens, it got put aside on my desk to be read "when I have time." Now I'm sorry I waited so long. I'm not going to rehash the message of the book, but would like to make a few comments about it and how it spoke to me. To begin with, the authors write repeatedly about "artmaking." They use this all-inclusive term to include painting, photography, composing, and all types of writing. I hadn't thought about it that way, but the creative process does have a lot of similarities, especially in the area of concern about making oneself do the work, worrying about how it will be received, agonizing over the commercial success that may result, and--if you succeed in these respects--going nuts hoping you can repeat the process. One sentence especially spoke to me. In discussing artists (of all kinds) who try to reproduce the styles of those who have been successful in the past, they say, "We modestly offer this bit of cowboy wisdom: When your horse dies, get off." I have heard repeatedly that the face of fiction, especially Christian fiction, is changing. Chick lit (whatever that really is) is supposed to be "dead." Science fiction is no longer a hot genre. And on it goes. If you're interested, check out this post from agent and former editor Rachelle Gardner, who spoke to a number of other agents at a recent Christian writers' conference. Then, if you're writing in some of those styles that are out of favor, hurry to find your hidden stash of chocolates and calm yourself. My second novel was written about the time removal of life support was a hot issue, and that was the main theme of the book. By the time the book was finished and had been sent to (and turned down by) several publishers, that theme was no longer the flavor of the month. I've come to believe that the advice I received long ago is really valid. Good writing will trump a catchy topic and will be around a lot longer. Since writers worry in much the same way that they breathe--as a part of their normal condition--I won't tell you not to worry. But I will suggest that you read Psalms 55:22 again. And keep writing. Writing is tough. Maybe you want to get a pen and right that down. And although the creative process involves one set of hands on the keyboard, I don't think anyone produces a worthwhile literary effort without significant input from others along the way. I'm not a member of a critique group. It's a personal choice, and I know that you can find writers who come down--hard--on both sides of the issue. I'm not going to discuss my reasons here, nor do I criticize those who find such groups helpful. But the input received in such a situation makes up one category of "advice" for writers. I've had various novels (I've written four) critiqued by three independent editors and four published authors. There's no question that each of them pointed out flaws that needed correcting and made suggestions that improved the writing. But I also noted a real danger that in taking their advice totally to heart I'd lose that intangible something called "author's voice." True, there are "rules" that are there for a reason. Avoid passive voice. Show, don't tell (although sometimes you just have to tell--but do it well). Motivation precedes reaction. Keep point of view consistent. All these add to the readability of a manuscript. But don't be such a slave to rules that your writing becomes stilted and predictable. The thing I believe a writer must keep in mind when considering advice--whether from a crit group, an author, an editor, or a first reader--is that writing is subjective. If taking recommendations to heart makes your prose wooden, your writing formulaic, then it's probably best to "screw your courage to the sticking point" and stick to your guns. I wonder if anyone ever told Shakespeare, "Bill, wouldn't it be simpler just to say 'Be courageous' instead of all that other stuff?" Remember, that in the end, results are what counts. Or, in the words of a famous advisor from my part of the world, "How's that working out for you?" I've often written about some of the books that are available to help those who want to learn to write better. In the three years that I've been writing, I've amassed a significant library. Not only do I own these volumes, I've actually read them--some of them several times, including highlighting passages and decorating them with Post-It notes to mark significant pages. We're coming into the season of writers' conferences, and I'm a fan of those, as well. Conferences give me the opportunity to sit in classes and hear experts share their knowledge, but they also provide me a chance to get to know other writers, as well as agents and editors. I think they're a great resource.This year I'll be attending the Blue Ridge Mountain Writers Conference, which has begun its own blog. Something that tends to be ignored is the information for writers that is available on various blogs and web sites, material that comes from agents, editors, and authors. You may want to get inside information on publishing from the blogs of agents Rachelle Gardner and Chip MacGregor. 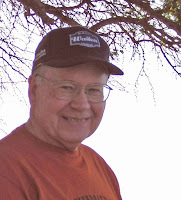 There's useful material at the new blog of Mary DeMuth and authors DiAnn Mills and Austin Boyd. 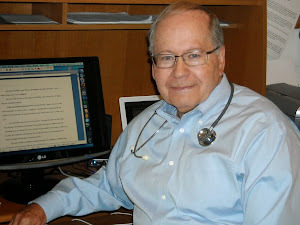 My friend, Dr. Michael Palmer, has a significant amount of information for writers on his blog. These are simply examples, and I apologize to anyone I've failed to mention. It's not an exhaustive list. A bit of searching will let you add many more sites. None of these sites will make you a finished writer, but they all offer the opportunity to learn from those who are established in the profession. And one thing I've learned early about writing--actually, about life--is that we should never stop learning. Write on. 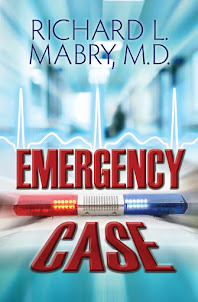 Today I have the privilege of interviewing a fellow physician whose novels of medical suspense have quickly become favorites of mine, and with whom I’ve struck up an enjoyable email acquaintance. Michael Palmer, M.D., is the author of the forthcoming The First Patient, as well as The Fifth Vial, The Society, and many others. He trained in internal medicine at Boston City and Massachusetts General Hospitals, spent twenty years as a full-time practitioner of internal and emergency medicine, and is now an associate director of the Massachusetts Medical Society's physician health program. RM: Michael, thanks for taking the time to chat with us. MP: Good to be here, Richard. RM: Although your position in medical administration is supposedly only a part time one, I know that your life is busy. How do you carve out the time to write? MP: I’ve never been an administrator, although I am one of the associate directors of the Massachusetts Medical Society’s Physician health program, taking care of docs with mental illness, behavioral problems, and chemical dependence. Currently I am working 5-10 hours a week. In the past I have worked 20-25. I write every chance I get. That's the long and the short of it. RM: You and Robin Cook both trained at Massachusetts General Hospital. Did his success as a writer influence you to try your hand at it? Or was it vice-versa? MP: I started writing because Robin was successful at it. RM: In some of your novels you deal with addiction, either to drugs or alcohol, and do it extremely well. Working as you do with physicians with these problems, what have you learned about them that might interest or surprise my readers? MP: I avoid the phrase "Impaired Physician" at all costs. Being a doctor hardly makes one invulnerable to the problems of addiction and alcoholism. Doctors fear that seeking help will jeopardize their license to practice. Usually NOT coming forward is what costs doctors their licenses. MP: Thanks for your kind words. I will give writing up the day I think I’m not improving. The best thing that is happening is how much better I’ve gotten at knowing right away when something I write is terrible, and not trying to fool myself into thinking it isn’t. RM: I’m looking forward to the release on February 19 of The First Patient. Can you give my readers just a hint about it? MP: There’s a nice summary of the book on my website. 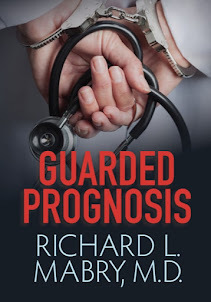 It deals with the president’s physician and long-time friend, who has good reason to believe the president is going insane, and then discovers that his condition my not be the result of natural causes. RM: Your web site also has great information for writers. Were there any mentors who helped you in your own writing career? MP: Only my agent and several great editors at Bantam and now at St. Martin's. Look up fortunate in your dictionary and you'll likely see my name. MP: Hope you all pick up and enjoy The First Patient. 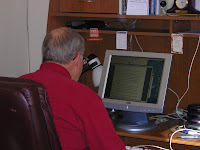 I would encourage all of my readers who are interested in writing to visit Michael's web site. You'll find a lot of helpful information there. While you're there, enter the contest he's running. The winner gets either a complete library of Michael Palmer books or a case of First Patient copies and an appearance by Michael at your book club. I hope you've enjoyed this interview, and that you'll come back to Random Jottings often. Well, the score was…. Oh, you don’t mean the game. You mean the book give-away. Sorry about that. 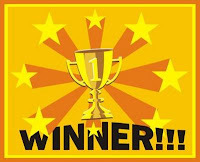 The winner of a copy of DiAnn Mills’ latest book, Awaken My Heart, is Laura Williams. Since Laura says she’s a home schooling mother of seven, I have no idea how she’s going to find the time to read the book. Nevertheless, her name was the one chosen at random from all those eligible. Congratulations Laura. DiAnn will be in contact with you to arrange to get your book to you. And thanks to all the others who left a comment. Come on back soon. I have a great interview lined up for Wednesday: Dr. Michael Palmer, whose forthcoming book, The First Patient, sounds like it’s going to be his best one ever—and that’s saying something, considering the caliber of his other novels of medical suspense.